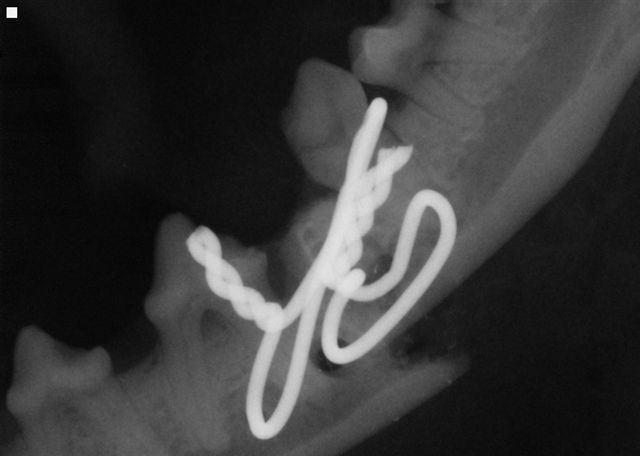 Jaw fractures are a very common problem in veterinary practice. The lower jaws (the left and right mandibles), or the upper maxillas (left and right facial bones) may be fractured (broken). When there is a fracture of the upper maxillas, the fracture may be obvious, or extremely subtle. Facial muscles and local swelling often make these fractures difficult to identify without dental radiographs. The cause of jaw fracture is most frequently from trauma. 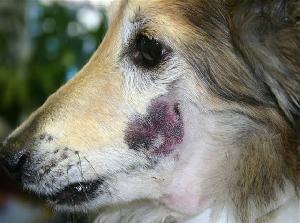 Animals hit by motor vehicles, baseball bats, golf clubs or balls are very common. We have recently seen jaw fractures from gun shot injuries (very sad and traumatic). Animals involved in fights or attacked by other animals, are also common causes of jaw fractures. Unfortunately, we frequently receive referral cases for jaw fractures as a complication of dental extraction procedures. Less common causes of jaw fractures include: metabolic disease, oral cysts and tumors. Lower jaw fractures are oftenly referred to as: mandibular, symphyseal or TMJ (temporomandibular joint) injuries. These fractures are typically easy to see, however, they may also be subtle. We refer to mandibular fractures as being "favorable or unfavorable". 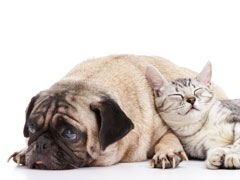 From the pet owner's point of view, they are always unfavorable, however, from the repair and healing perspective, "favorable and unfavorable" are meaningful terms. 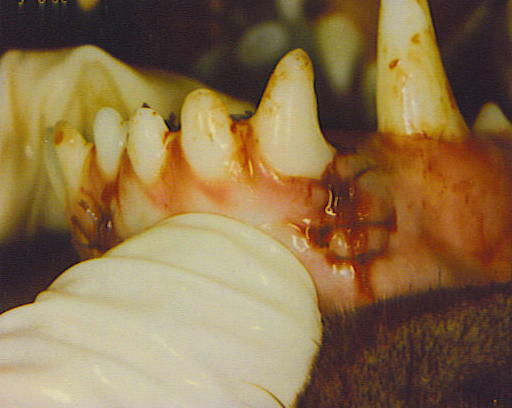 Jaw fractures in species with continually growing teeth (rabbits and rodents) are absolutely life threatening. Jaw fracture repair must result in a precisely correct anatomic alignmant, otherwise malocclusions (abnormal teeth relationships) develop. These animals are unable or unwilling (due to pain) to eat, and die. Favorable or non-favorable mandibular fracture? The muscles that close the mouth are the masseter, medial ptergoid, and the temporal muscles (muscle group). These muscles insert (attach) on the caudal (back) body of the mandible. They pull upward and forward on the jaw to close the mouth. The digastricus muscle works in opposition to these muscles, pulling the rostral (front of the jaw) downward and back (caudoventrally). When this downward jaw motion of the digastricus and the upward motion of the opposing "muscle group" separates or displaces the mandibular fracture line, we call this a "non-favorable fracture". These fractures tend to run from a rostral-dorsal to a caudoventral orientation. Fractures perpendicular to the mandible also tend to be "unfavorable". Continual motion of the fracture line, from opening and closing the mouth is not favorable for healing. Therefore, we must repair the fracture with this consideration in mind. The "favorable" jaw fracture does not have fracture line displacement. Therefore, the healing is more favorable. Our treatment of a mandibular fracture is based on the orientation of the fracture line, the severity of bone fragmentation, the degree of contamination, and our assessment of the regional blood supply. If the blood supply is severely damaged and there is extensive bone fragmentation, mandibulectomy may be recommended rather than mandibular repair. Biomechanic ("favorable or non-favorable") considerations greatly influence the decisions in repairing mandibular fractures. We prefer wire reinforced composite splints for most jaw fracture repairs. With fractures having minimal displacement, we consider conservative repair techniques such as tape muzzles. The most important goal in jaw fracture repair is to allow the pet to eat comfortably, soon after repair. We also want to maintain normal occlusion. If either the upper or lower jaw heals in the wrong alignment (orientation), the patient may suffer from a malocclusion. Additionally; it is very important to avoid injury to tooth roots and the neurovascular (nerve and blood vessels) bundle within the mandibular or infraorbital canals. The ultimate goal is to successfully repair the fracture. Biomechanical forces must be evaluated and addressed to allow for optimal healing and repair. What can you expect with jaw fracture repair? Accompanied with severe injury to your pet, are the feelings of despair, fear, anger and possibly, guilt. Please be assured we are here to help! Dr. Kressin has spent many hours managing similiar trauma cases. Operative treatment of veterinary craniomaxillofacial trauma and reconstruction is a skill, and an art. The prognosis for jaw fracture repair is typically good to excellent, with some exceptions. Maxillary fractures tend to be fairly stable (or can easily be stabalized) and carry an excellent prognosis. The prognosis for mandibular fractures is more variable and heavily influenced on the cause(s) of the fracture(s). Mandibular fractures resulting from minor trauma such as, falling off a deck, tend to have a good to excellent prognosis. 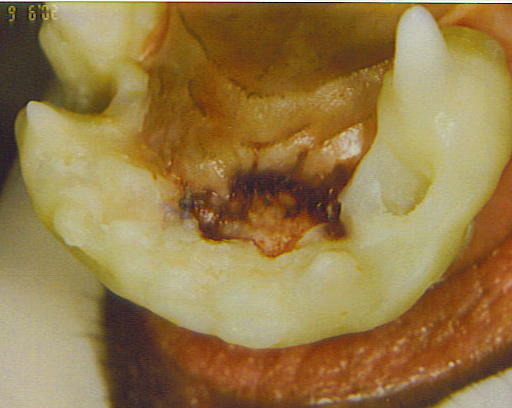 Older small breed dogs with severe periodontal disease that suffered fractures during surgical extractions, tend to have less favorable healing characteristics. The prognosis may be poor, guarded or fair. The prognosis is also dependent on the severity of the injury. If the neurovascular blood supply is damaged, the prognosis is reduced. The cause of the trauma, impact force, the duration of the injury and bacterial contamination all affect the prognosis. Our initial consultation is an excellent opportunity to discuss treatment options, cost considerations and long-term prognosis. It is not possible to determine the ideal treatment, the exact cost, or prognosis at the time of the initial consultation. the incisive bone and maxilla. The tissues were re-aligned and the soft tissues were sutured. A composite splint was applied. Another view of the splint stabalization. right upper incisor and canine were treated by root canal therapy. the fracture as shown above. Wire penetrated the mandibular canal and its contents. 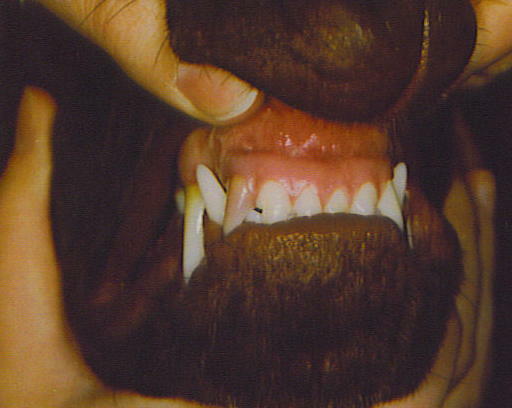 The dog was uncomfortable, pawing at the face, and the teeth were occluding abnormally (malocclusion). performed. The left mandible was removed. A large dog attacked this dog. Wire and splint repair technique. Right side view; two weeks after bilateral rostral Mandibulectomy. Front view; 2 weeks after bilateral rostral mandibulectomy. Left side view; 2 weeks after bilateral rostral mandibulectomy. Right mandibulectomy was performed due to a tumor. 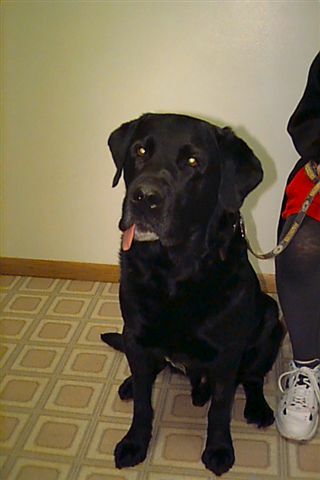 This dog did remarkably well immediately after surgery. 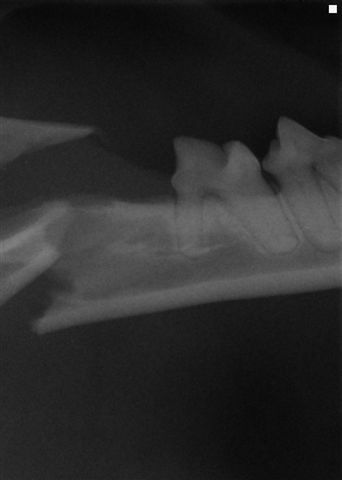 Initial mandibular fracture, very small dog. 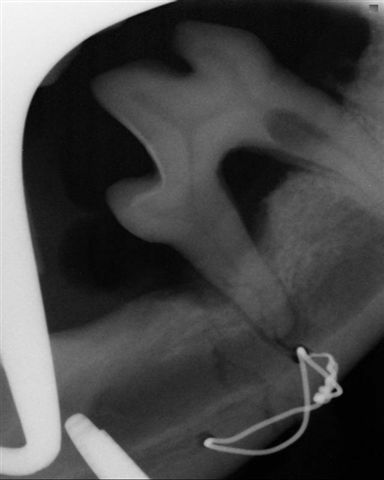 Wire placed into mandibular cortex to approximate fractured jaw segments. Wire reinforced composite splint was used to repair fracture for 5 weeks. maxillary bone fractures. A splint was used for the repair. premolar after playing with bigger dog (first premolar missing). 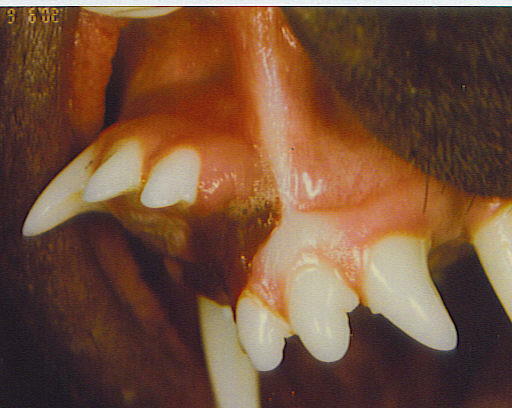 ensure that the canine and premolars remain vital (alive). Jaw fracture as a complication of dental extraction. Six weeks after repair healing is evident. 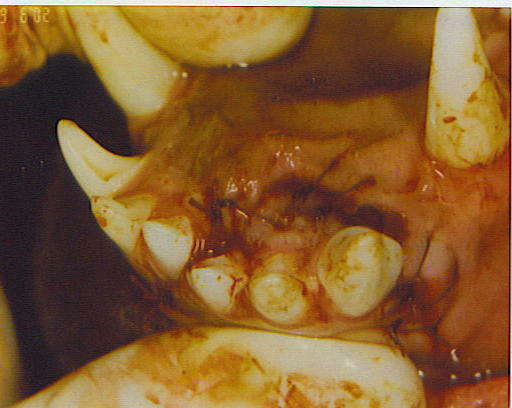 The right lower canine was previously extracted. See images below. Wire was placed using a modified Stout's multiple loop technique. Notice both canines were missing. The wire reinforced splint bridges the fracture site. This stabilizes the fracture site to allow for healing. Left side view with splint bonded to the teeth. Left side view of splint stabilization of left jaw fracture. opposite side of the fracture. Front view six weeks after splint was fabricated. Alternate view six weeks after the initial surgery. Dental radiograph demonstrating healing of the fracture site. 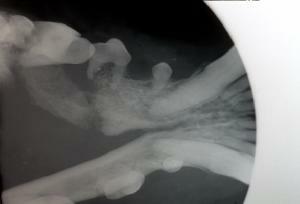 This cat had a fracture 1cm behind the right molar. 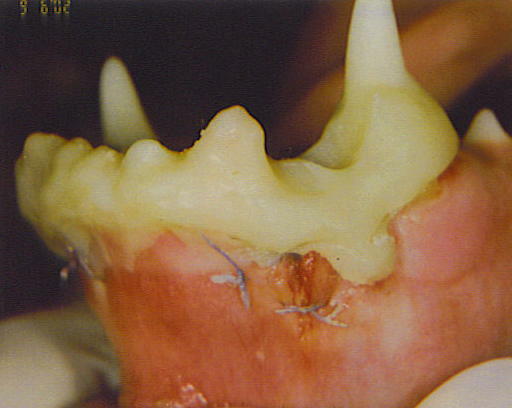 The four canine teeth were splinted together to allow for fracture repair. Wire was placed to approximate fractured jaw segments. 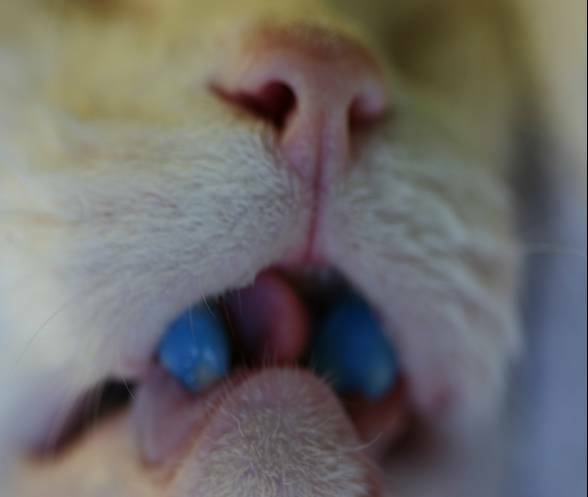 A window fell onto this cat causing a jaw fracture. A tape muzzel was used to repair the jaw fracture. Jaw fracture seemed to occur abruptly. The fracture was due to a jaw tumor. Symphyseal separation with soft tissue swelling in a young rabbit. Young rabbit symphyseal separation repair using a composite splint.